Carla Brandberg and Erin Cronican in 'Night Mother. Photo by Russ Rowland. 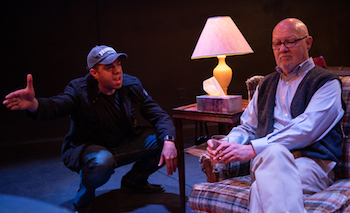 The Seeing Place presents two hard-hitting two-handers in rep in an intriguing study of parent/child relationships. In Caryl Churchhill's A Number, Bernard (Brandon Walker) discovers that his father, Salter (Michael Stephen Clay) -- or at least the man he thinks of as his father -- has been harboring some pretty dark secrets about their relationship. In fact, Bernard discovers he is one of "a number" of genetically cloned individuals who Salter had created to replace his biological son. Clay is intriguing as the father confronted in a pack of lies -- and emotions -- while Walker portrays a number of the clones confronting Salter. Just how are we connected to those we love? 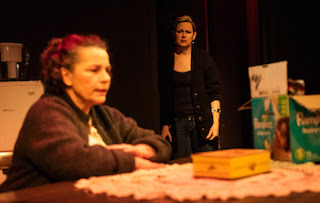 In Marsha Norman's Pulitzer-Prize and Tony-Award-winning play 'Night Mother, a difficult, but loving mother-daughter relationship seems like any we might experience until we realize that the clock is ticking (literally) in what are the last minutes of life for Jessie (Erin Cronican), who plans to commit suicide right after she gives her mother (Carla Brandberg) her weekly manicure. . .
Brandberg is engaging, personifying both a woman oblivious to her daughter's emotions as well as a mother who loves her daughter and who is at a loss to help. Cronican's matter-of-fact delivery of Jessie's gut-wrenching lines adds to the building terror as we -- and Mama -- realize she's serious about ending it all. It's a nice pairing of works nicely presented on a set that works for both. Lighting Design by Joyce Liao. Sound Design by Brandon Walker. Scenic and Costume Design by Erin Cronican. Stage Management by Mackenzie McGuire.